The Guy Fawkes mask is the symbol of Anonymous but guess who licenses that likeness? The cheeky guys over at 4Chan that formed the basis for the amorphous Anonymous hacktivist group wanted to hide their identities when they congregated for a protest outside the Church of Scientology. 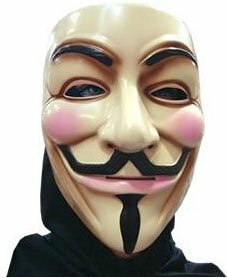 They settled on the Guy Fawkes mask as worn by V in the adaptation of Alan Moore's V for Vendetta because the anarchic hero seemed to align with their philosophy. The group first used the masks in a protest in 2008, two years after the film V for Vendetta was released by Warner Bros. Pictures. Since then, members of Anonymous have purchased the masks and worn them whenever they have assembled in public, contributing to the Guy Fawkes mask being a hit at retail stores and online - Amazon.com lists the mask as its bestselling. But because Warner Bros. owns the license and receives a portion of the proceeds from each mask sold, Anonymous actually lines the pockets of the corporate overlords they presume to hate. "We sell over 100,000 of these masks a year, and it's by far the best-selling mask that we sell," said Howard Beige from Rubie's Costumes, the company that makes the mask. "In comparison, we usually only sell 5,000 or so of our other masks." "It's a symbol of what Anonymous stands for, of fighting evil governments," said a protester wearing the mask last month outside another Scientology protest. "You can get a mask and join the fight, too! But I heard the costume store is sold out until Friday." Here's terrible twist of logic: The Church of Scientology is known to receive large monetary donations from people who earn money from Hollywood. A portion of those famous actors and filmmakers have probably worked on a project that was produced by one of the many companies in the Time Warner umbrella (HBO, New Line Cinema, Turner Broadcasting to name a few) and received payment from them. Therefore, each time an Anonymous member buys a mask, you could argue that they are sending money to Scientology. Of course, things like this happen all of the time. One can never be sure the money you fork over for something actually goes to a cause that you would want to support. There's no way to know, for example, if the money you spent on canned corn in 2004 wasn't used to fund terrorism in Saudi Arabia or George W. Bush's reelection. Consumers are often told to vote with their wallet - and they still should whenever an issue is apparent to them - but the reality is that we can never know for certain whether the money that leaves our hands is not somehow used in a way that we wouldn't like. That's why every good Anonymous member should steal the Guy Fawkes mask whenever they have a big protest coming up. It's the only way to be sure.